Who's ready for some more spooky Requiem dramz with dreamy Brendan Coyle? Me too! I'm slightly behind, ahem, so I might try to rush a few through. Rolling S1:E03 The Necklace after the break. Here is a link to the last recap I wrote, S1:E2 The Blue Room, go ahead and get caught up. I totally had to. We open back on the fateful day that young Carys Howell (Emmie Thompson) went missing and now we get to see everyone involved. Natalie Franken (Nicola Reynolds) is clearly dealing with something serious (cancer, perhaps? She has a headscarf) and heads to the payphone (back when they had payphones), leaving Carys with her daughter Trudy (Sian Reese-Williams). Trudy instead heads off into the woods to have her arm set on fire by some super fun boys and emerges to her mother shouting for Carys. Whoops. We see Trudy back in the present time...is she the barmaid we met? She is! And is she...being shagged? Yes again! Jaysus, that was an odd segue. It's the scruffy-looking guy from the bar she was defending, hm. Back at Nick Dean's (James Frencheville) mansion, Matilda Gray (Lydia Wilson) is poring over the two necklace pieces she has of Carys from when she was little. She got the second piece off Carys' dad in the woods yesterday. Carys' mum Rose Morgan (Claire Rushbrook) is also reliving the past, she told Tilly (what we call Matilda) that she couldn't remember what she was talking about in the woods lo those many years ago, but she clearly does. See, Tilly's mum was acting weird then committed suicide in front of Tilly, who then found a bunch of weird photographs at her house, including one of Rose talking to a strange man. That's also where she found one half of the necklace. Rose's reminiscing is interrupted by her son David (Brochan Evans) screaming, he's having night terrors again. His dad Aron (Richard Harrington) obviously thinks it's because Rose is stirring things up again. In looking for her missing daughter that was gone long before he was on the scene. Okay, the next morning he's concerned about her and suggests a doctor, it's not just the violence he displayed earlier. He seems very controlling, but that might be concern. It's hard to tell from this side. It's a lovely morning for Royce Evans (Charles Dale) heading out to check on his sheep. His dog won't stop barking, what's wrong? All of Royce's sheep have been brutally slaughtered, he also feels a presence watching from the woods as Tilly did. Tilly wakes up on the sofa to the sound of crying, coming upstairs to find a small figure writhing under the covers on her bed...ah but it's a dream. Nick wakes her up grumpily, perhaps because she didn't sleep upstairs with him, but there's also a police officer to see her. He wants to see the evidence she has as to her identity, so she brings out the necklaces. The problem is that the necklace wasn't listed as being on Carys when she disappeared AND how can Tilly say for sure the hobo she met in the woods was Sean Howell (Sam Hazeldine)? It could just be any old hobo with a matching necklace in his tree. Tilly gets her final caution from PC Graves, who is all done with Tilly stirring up shite in PaddingtonBear, Wales. Stephen follows Tilly outside to ask for more information about Sean Howell, he always felt there was something wrong with Sean but knew he wasn't the kidnapper. In the end he let him go, long after Sean's reputation had been torn to tatters. He feels responsible for not solving the case, he didn't catch who did it and his retirement watch is one big reminder. He's all genial smiles and friendliness until Tilly asks if Rose's story measured up, he warns her to leave Rose out of it. He's gone with a swirl of his coat (Brendan Coyle is a great coat swirler). Of course I'm going to gif as much of Brendan's screentime as possible, pfft. Tilly's friend Hal Fine (Joel Fry) who came with her from London is struggling a bit. He can't get wifi, write music properly or even sleep. He's staying at the Inn where Trudy works, she's shocked to hear the latest from her scruffy fella about Tilly claiming to be Carys. Word has indeed traveled fast, a woman approaches Rose at her son's footy practice and her concern and questions lead Rose to drag David out by his elbow in front of everyone. Meanwhile, Trudy's online researching Hal and Tilly until her dad interrupts and tells her to throw Hal out of his inn. Trudy tells Hal to keep his head down and makes some small talk before asking to see Tilly, she was the last person to see Carys before she went missing. It's not an important plot point, but there was a sweet moment between Hal and Trudy when he was excited she knew he was a musician by his hands. I think Joel Fry is aces. Rose is looking for help, to stay with her dad maybe? But he says no and she loses her temper with David, who understandably wants to know what's going on. Royce has a plan for whatever/whoever is killing his sheep, it involves some massive bear traps and I hope none of the sheep come across one. Jeebus wept. Trudy's scruffy fella Ed Fenton (Dyfan Dwyfor) is hanging around when PC Graves shows up, he skitters like a vampire about to get a tan. He doesn't want to answer any questions about the death of Nick's uncle, who committed suicide around the same time that Tilly's mum died as well. Rose and Tilly are meeting at a field, what will it take to make Tilly go away?! I suggest a DNA test, check with the Surgery, surely they'll have something they can send away, even in PennyForYourThoughts, Wales. Tilly had always wanted a bigger family, and she felt connected when she met Rose and then Davey...she felt it too, didn't she? Rose steps forward, and we all flinch until she touches Tilly's face with both hands. She cries, her hopes were falsely raised so many times in the past by liars and I cringe when I hear Tilly say "but you're my mother" because we still don't know yet and that seems like something you don't want to say until you KNOW. See above. Rose screams and hands back the photos, just go away! Ohh I see, Ed has called Aron about the police continuing to press him about when/where he found Ewen Dean's body, he's been lying for Aron. And getting paid for it, apparently, interesting. Tilly goes to see Dean family matriarch Meredith (Jane Thorne) and snaps a bunch of pics while Meredith's carer tries to get rid of her. She knows Rose is lying to her, but she doesn't know why or about what. She swears at a deaf old lady in her night jacket and somehow that makes everything alright and Meredith spills. Well, kind of, but first she has to clear away Carl the Carer (Oliver Lansley) and any misunderstandings. Tilly's next stop is a field where Nick and Sylvia Walsh (Tara Fitzgerald who was Selyse Baratheon in Game of Thrones, unfortunate mother to the beautiful and doomed Princess Shireen) are waiting to give a history lesson on the Dean family. Then she's off to see Hal, who tells her about his new work of music (perhaps transferred to him telepathically from a satanic aristocrat) before he passes on Trudy's message. Trudy herself is trying to resist being lured away to a movie by Ed and ends up in the backseat. Rose is having a tense supper with Aron and Davey, who tells his dad about his mum dragging him off the pitch and we're into it and Davey is eating downstairs. Thankfully, Aron isn't violent this time again, he's supportive and understanding. Trudy has taken Hal and Tilly to the old Howell house, she tests Tilly's toes too. Second toe longer! Trudy calms down and shares some of her memories, guilt and thoughts about her mum maybe knowing more than she said about the disappearance. Trudy seems certain now that Tilly is Carys. Rose gets home to an empty house, Aron has taken David away and her car and the calm act earlier was just to lull her into a sense of security so he could sneak away her son. Holy shite I know the name of the town!! Welcome to Penllynith! Sitting there they see Aron's truck going by and decide to go see Rose again. Back at the Inn, Ed's there (carefully not looking directly at Trudy who totally lied to him) helping her dad who fell down the stairs. She tells him she believes Tilly is Carys, but he doesn't want to hear it. At some point you have to wonder if the people the most against the idea are the ones that know definitively otherwise. Tilly and Hal walk right into Rose's house and it's a good thing they do, not only has Rose been looking at old photos of her life as Rose Howell, she's also tried to drown herself in the bathtub. Ah Tilly, go get a DNA test and leave this woman in peace. If I ran a show, everyone would be very sensible and nobody would watch because it would be boring af. I'd probably have great music, though. Aron is extremely angry with Tilly, and even Hal understands that Tilly must now stay away, even if Tilly does not. Ohhhh, back at the Dean residence everyone is over because the other person Tilly yelled at today has died. Meredith took her secrets to her grave and Carl is making sure everyone knows Angel of Death Tilly riled her up directly previous. Tilly goes up and bangs at her cello to work through her feelings, playing herself into a stupor while the wind blows alll the curtains and the air whispers. Her phone draws her away, it's her mum's friend Kath in London with her birth certificate. Tilly's dead mum appears as Tilly opens the scanned document on her phone. 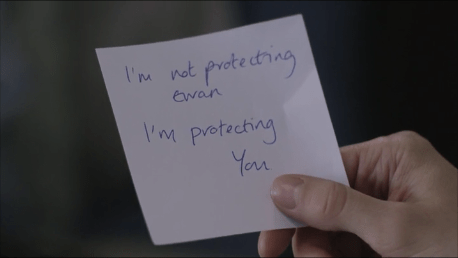 A musical montage plays us out as a worried Aron sits by Rose's hospital bedside, Hal stares at the music in his head drawn on paper and Tilly destroys her cello. Tilly cries as Hal lies on the music and Trudy lies on her bed, remembering her mum's distress and self-castigation over Carys' disappearance. Young Trudy finds her dad starting a washload in the middle of the night, let's keep it our little secret, all right? There is just nothing good in that sentence ever. We're out, but...we didn't get to see what was in the birth certificate that Tilly saw, did we? I ran it back, nope, just a lot of cello smashing under a shocked face. I'm half done now, will attempt to catch up before the finale, but as you know: people plan, gods laugh. Oh. Nevermind, I see it's already aired, but I will still try to finish sooner rather than later. Cheers!